"He was deeply in love. When she spoke he thought he heard bells, as if she were a garbage truck backing up." This may not actually be one of the scene descriptions in the screenplay for the proposed CASABLANCA remake, but we bet it is close to being accurate -- damn accurate. Yes, the entire staff at Needtovent must hereby express its saeva indignatio at the thought of a CASABLANCA remake regardless of who might be involved in the production. 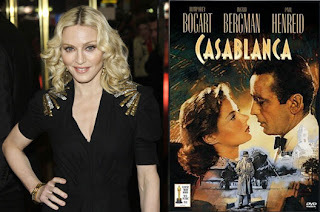 But to add insult to injury, we understand that producers are intending to cast Madonna in the role Ingrid Bergman so beautifully portrayed in the original. Madonna for cryin' out loud; is nothing sacred? Makes one wonder who would play opposite her -- perhaps Pee Wee Herman is available. The project has not yet been formally announced, but loyal readers of Needtovent have been forewarned. Please feel free to leave any comments that come to mind. I guess they think that technology can overcome great acting.....Hmmm do you think they have wondered why movies are only at the theater for a week. Do they really believe it is because you can see it on DVD within 6 mos. I wonder have they asked themselves, Oh sure they have but yes men or women have blamed it on media. maybe they should try doing a movie with actors instead of bodies and explosions! Time may go on, but it doesn;t mean that all advances are good. Madonna, hogwash!